Key Stakeholders: UT, CCI & PU – What Do All These Acronyms Mean? We wouldn’t be in this project if there was no Urbantransitioners. 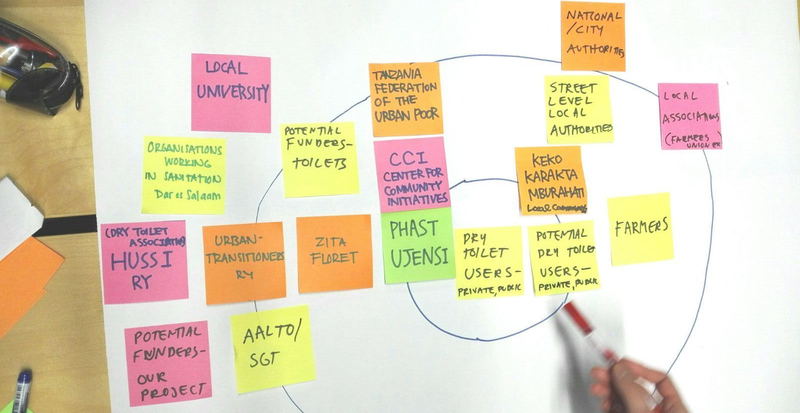 Urbantransitioners is a NGO founded by three former Aalto University students, including our mentor Zita Floret. Like our U R IN: Team, this collective is also multidisciplinary and international. The entity works to facilitate “smoother urban transitions” within low-income settlements, and helps the communities to build themselves a more sustainable future (Urbantransitioners Ry, 2017). Urbantransitioners initiated this project along with Huussi Ry and CCI (more info below) in 2013, and without their commitment and hard work, you wouldn’t be reading this post now. You can learn more about them on their webpage and find out how to contribute to their work – or even collaborate with them! Centre for Community Initiatives, commonly known as CCI, is a Dar es Salaam -based NGO that works for and with the poor communities in both, rural and urban areas in Tanzania. One of their key activity is to provide micro-saving schemes and loans for people in the settlements, and with the loans the people have been able to buy EcoSan dry toilets for example. In addition, CCI’s engineers have been working closely with the communities in the field to make this project successful. Besides sanitation, CCI focuses on climate change, HIV/AIDS, and housing related projects to name a few. More information can be found on their webpage. During our field trip, CCI was the closest stakeholder that was along us the whole journey: we started the trip with their presentation on their work, and ended it with a presentation on our findings for them. During the trip, we got valuable information and insights from many CCI employees, as well as help from skilled translators. They connected us to the settlements and made our workshops possible by inviting important stakeholders, such as authorities, farmers, and toilet users to participate. Many thanks for making it all happen! We had the pleasure to get to know PHAST Ujenzi (Participatory Hygiene and Social Transformation, ujenzi = construction in Swahili) groups in the settlements we visited. These groups are mostly comprised of women and they are central actors in this project: they are responsible for the marketing and construction of the toilets in the settlements. In the initial project, PU members were trained, and they acquired skills to plan, construct, and maintain the toilets. Before the trip, we were very excited to meet these members since we had heard so much great things about them – and they truly were amazing people! It was impressive to see their willingness to act and how empowered they were. They certainly took their audience in our workshops and convinced a lot of people of the advantages of EcoSan toilets. It was a pleasure to get to know and work with the PU members, and I bet we all learned a thing or two from them. Other stakeholders that we met during our field trip included e.g. farmers and toilet users who participated in our workshops. It was off importance to hear their insights on using the toilets and urine as fertilizer. We learned for example that urine has worked even as a pesticide! As said, it was a pleasure working with all these brilliant people who are involved in this project somehow. We’re eager to see how this projects evolve, and how especially the PU members gain more skills and independence. So good luck for next year’s team, it’ll be a pleasure for you too! Previous Ecological Sanitation – What Is It All About? Next What Is Your Impression on Using Urine as Fertilizer?